If you have too many software installed in your computer and want to remove few, go to control panel and and open “Program and Features.” Here, you will see the list of all the programs installed in your computer. Now the toughest part is to decide which program should You uninstall. If you are not a geek, you will find it difficult. There will be many device drivers and other useful programs necessary for your system. And there will also be few adware installed with some other software. Most of the people take help of their geek friend in cleaning the PC and remove unwanted software. 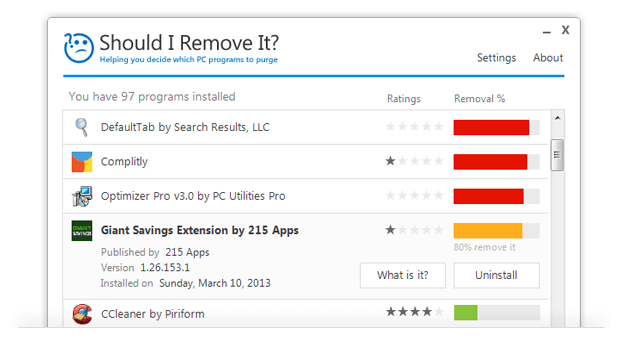 But there is a nice tool called “Should I remove it?” which can help you in this. This nice tool will let you know what program should you remove from your computer. It is only of 2 MB in size and works on all recent versions of Windows. It is malware free according to VirusTotal, so you can trust.Once installed, run the program. It will show you all the programs installed in your computer along with the rating given by other users. If you are confused about a program, rating will help you to decide whether you should use it or not. By clicking on “What is it?” you will get more details about that software. Or you can simply search on Google about that software.Clicking on “What is it?” button will take you to the shouldiremoveit.com with details about the program. You can see malware detection history in that software. Do a proper research with this tool and then uninstall all those programs which are risky. You can also uninstall those programs which are safe, but you never use. Removal % is just an indication. If so many people have removed a program, it is not necessary that you should also remove it. If the program is safe and you enjoy it, you can keep it. If you have decided to uninstalled, you can directly uninstall the program. So, you do not need to go to control panel for this.